NEW NAME & LOGO – SAME GREAT SERVICE! Diefenbaker Spice & Pulse (DSP) is proud to unveil their new logo and name for 2017! Celebrating our 20th year in business this year we thought it was time for some freshening up. 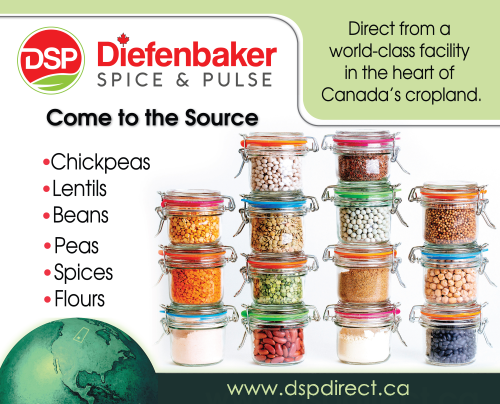 Diefenbaker Seed Processors has become Diefenbaker Spice & Pulse. The name change more accurately reflects the core business of our company. Plainly put, we supply high quality ingredient spices, pulses and flours to markets around the world. Going forward you can expect the same great service from the same great team – only with a more modern look! DSP is a family owned and operated spice & pulse processor, miller and packager. We work alongside a related farming operation of about 8,000 acres. DSP has become excellence leaders in their industry through their customer focus, quality certifications, and flexibility to deliver on time and exceed customer expectations. In addition to bulk and large bag shipments, we offer a branded line of Kashmir Valley™ retail products in 2, 4, and 8 lb options as well as private label options to our customers. We pride ourselves in providing customers a complete, locally sourced, farm-to-plate solution. DSP sells its products to the high quality requirements of the North American ingredients manufacturing, packaging and canning industries as well as to export markets around the world. Certifications include Hazard Analysis Critical Control Point (HAACP), ISO 9001:2008, and Kosher. To place an order or for pricing with DSP, contact us at (306) 644-4704 or email admin@dspdirect.ca. DSP continues to offer Retail Packaging in-house! We are offering our own brand, Kashmir Valley™ and Private Label offering depending on your own specific requirements. We also offer 20 kg, 25 kg, 45 kg, or tote bags with or without palletizing/wrapping. Shipping may be by floor loading, mixed/consolidated palletized loads, or by ocean container overseas. Knowing our product from the ground up in terms of quality and variety, we provide exceptional value to our customers, direct from a world-class facility in the heart of Western Canada's cropland. Please contact us at (306) 644-4704 or admin@dspdirect.ca to source, price, and order our products.